A/SP 22 08 on KE7 1d (SG.65). 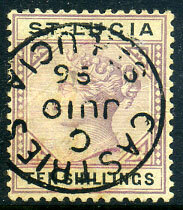 dated C/JU 16 93 with lettering further away from the outer rim than the genuine on QV 6d (SG.49). No.354 illustration in the Madame Joseph handbook of forgeries on QV 3d (SG.47), defective perfs. at left. A/OC 15 14 on KGV ½d (SG.78). 21mm cds dated C/SP 4 94 (curiously applied "4") on QV 1d (SG.44). C/OC 4 91 on QV 1d (SG.44). 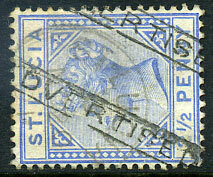 (VF2) */14 SP 22 on KGV 1d (SG.79a). 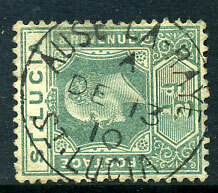 dated M/2 AU 22 (LRD) on KGV 1d (SG.79a). 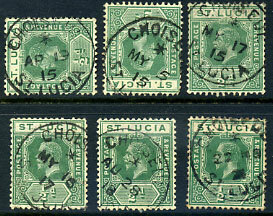 dated */AP 19 15 (ERD), */MY 5 15, */MY 17 15, */MY 15 17, */AU 28 18, */22 NO 21 all on KGV ½d MCA wmk, stamps fine. 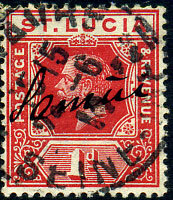 D/OC 10 89, DENNERY */12 JU 21, GROS-ISLET G/23 SP 07, S/NO 16 02, stamps fine. 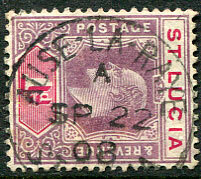 (S2), apparently no code/25 MY 23 on KE7 1d MCA wmk (SG.66), either a date slug error or abnormal late use on this stamp. 19mm cds forgery with hyphen in name dated C/OC 16 -6 on manuscript used QV 6d (SG.49). 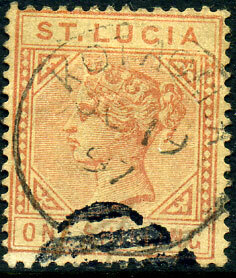 1885 QV 1/- orange-brown (SG.36), a forgery believed to have been cleverly executed by the Belgian forger Smeets by bleaching out the design of used copies of the 1886 Ceylon QV 5c dull purple (SG.195) to a give a "blank" CA wmk P.14 stamp; only immediately given away by the indelible ink KOTAGALA (Ceylon) OC 19 97 cds which could not be removed. 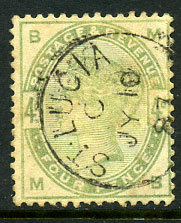 arrival dated 7-6 14 on KGV 1d (SG.79). 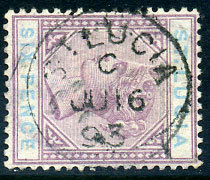 large part unidentified 2-line h/stamp on KE7 1d (SG.59), stain at lower right. (M.1) dated M/OC 6 11 on KE7 ½d (SG.65), perf. fault at base. (M1) dated M/MY 7 06 on KE7 ½d (SG.64a). 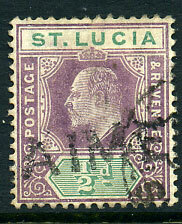 (D1) dated D/OC 26 12 on KGV 1d (SG.79), rare on KGV issues. 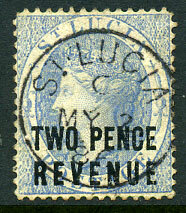 1882 QV 2d pale blue (SG.F14) dated C/MY 2 86, some thinning. 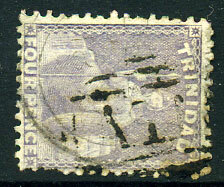 arrival on Britannia 4d (SG.70b) very lightly pmk'd Trinidad DE 20 1870 dbl-arc. 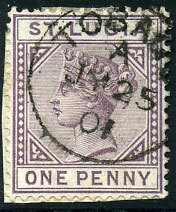 m/script used QV 6d violet (SG.28) with forged A01 numeral added. 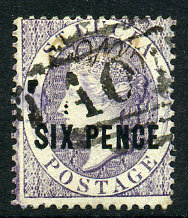 part strike on KE7 ½d (SG.64). arrival dated A/JY 5 01 on QV 1d (SG.44), unusual. 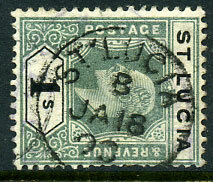 (A1) dated A/DE 13 10 on KE7 ½d (SG.65). 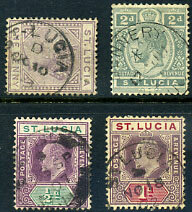 dated C/JY 10 87 paying the correct UPU rate between UK and St. Lucia pmk'd on arrival from R.M.S.P. mailboat, or as loose mail on arrival from mail posted on board a British vessel. Exceptionally rare use and a probably unique display item. 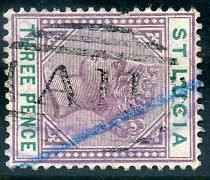 the ST. LUCIA B/JA 18 03 forgery on 1902 KE7 1/- Crown CA wmk (SG.62). Close match to Ritchie handbook Page 59 illustration, rarely found. 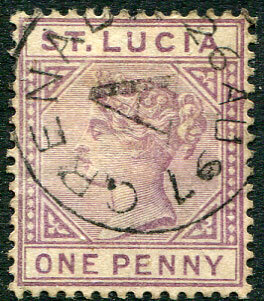 on QV 2½d (SG.46), light ST. LUCIA C/NO 20 91 cds.